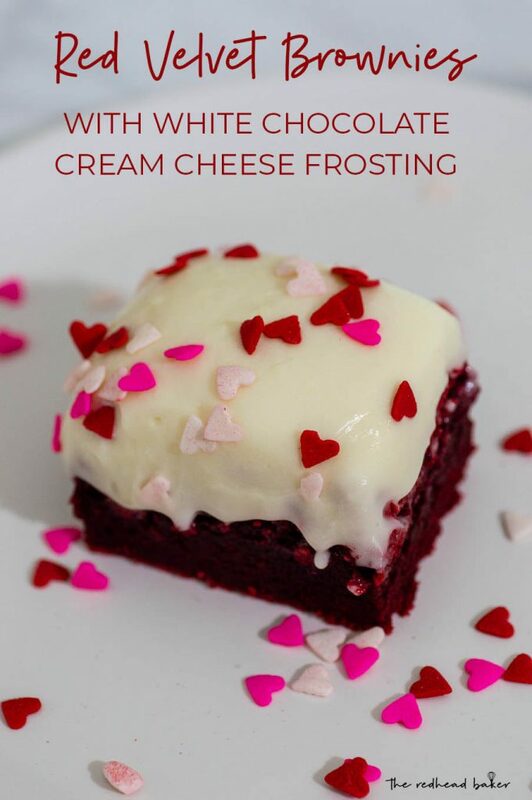 Red velvet brownies are a delicious bite-size Valentine’s Day treat, and they’re topped with creamy white chocolate cream cheese frosting. It’s February already, which means Valentine’s Day is almost here! We don’t put a lot of effort into celebrating Valentine’s Day. We buy cards, and a box of candy. I might make a fancy dinner at home. Our son’s class usually exchanges cards and sometimes treats. If you’re tired of making cupcakes for class exchanges, give these red velvet brownies a try. The deep red color is perfect for Valentine’s Day! The brownies themselves need only one bowl to mix the batter. The frosting is optional (I know my son wouldn’t eat anything with “cream cheese” in the name), but it does make adhering the Valentine’s hearts sprinkles easier. What is red velvet, anyway? The name originally came from the red hue caused by the non-Dutched cocoa in the batter. Later on, during the rationing during the World Wars, bakers sweetened their cakes with boiled beet juice, which also gave the cake a red color. Now, it’s just red food coloring. While the cake has been around since the Victorian era, it’s widely considered a Southern United States regional dessert. This cake also serves another purpose—I’m participating in The Little Kitchen‘s third annual Valentine’s event to raise money for Cookies for Kids Cancer. 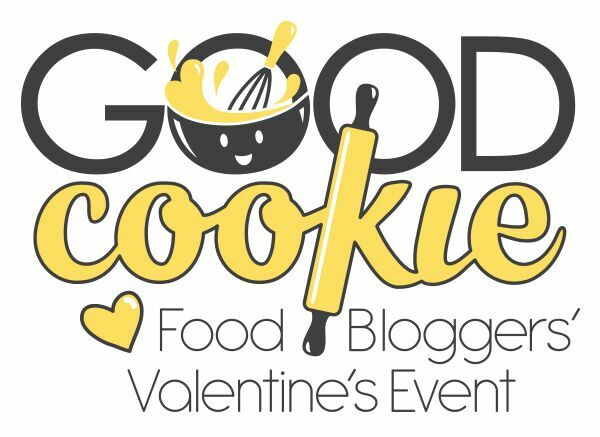 This is the third year for Julie’s Valentine’s event! I’m proud to help make a difference in the fight against pediatric cancer. Red velvet brownies are a delicious bite-size Valentine's Day treat, and they're topped with creamy white chocolate cream cheese frosting. Preheat oven to 350 degrees. Line a 9-inch by 9-inch baking pan with tinfoil, leaving 3 inches of overhang on two opposite sides. Spray with nonstick cooking spray. Set aside. Bring about an inch of water to a boil in a large saucepan. Place the chopped chocolate and butter in a large mixing bowl. Place over the boiling water (do not let the mixing bowl touch the water), and melt the butter and chocolate together, stirring often, until smooth. Whisk in the sugar, then the eggs, one at a time, making sure the egg is fully incorporated before adding another. Stir together the flour, baking powder and salt, and add to the chocolate mixture. Stir in the food coloring and vanilla extract. Pour the mixture into the prepared pan. Bake for 44 to 48 minutes. In a medium mixing bowl, beat together the cream cheese and butter until well-combined. Add the melted chocolate and vanilla extract; mix until incorporated. Gradually add the powdered sugar and salt to the frosting, beating until light and fluffy. Use the overhanging tinfoil to lift the brownies out of the baking pan. Spread the frosting over the brownies. Sprinkle with Valentines hearts sprinkles (if using). Cut into quarters lengthwise, then rotate the brownies 90 degrees, and cut into quarters again to make 16 small brownies. Coleen, You are wonderful for creating and sharing this lovely recipe for such a worthy cause!